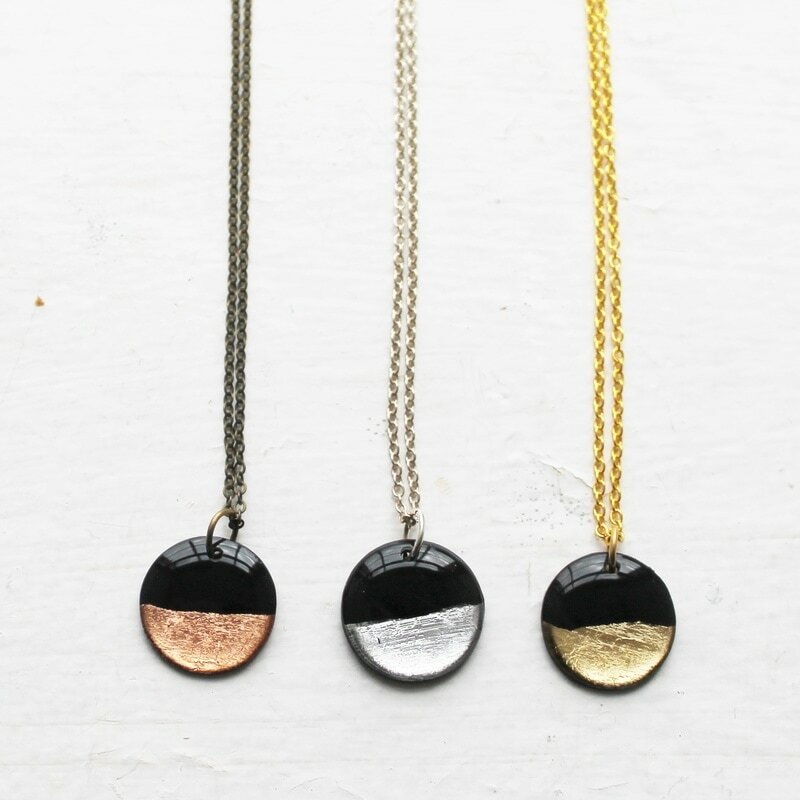 ▷ The backs of the necklaces are left untouched and feature the vinyl record in its original state, giving them a very unique and quirky touch. 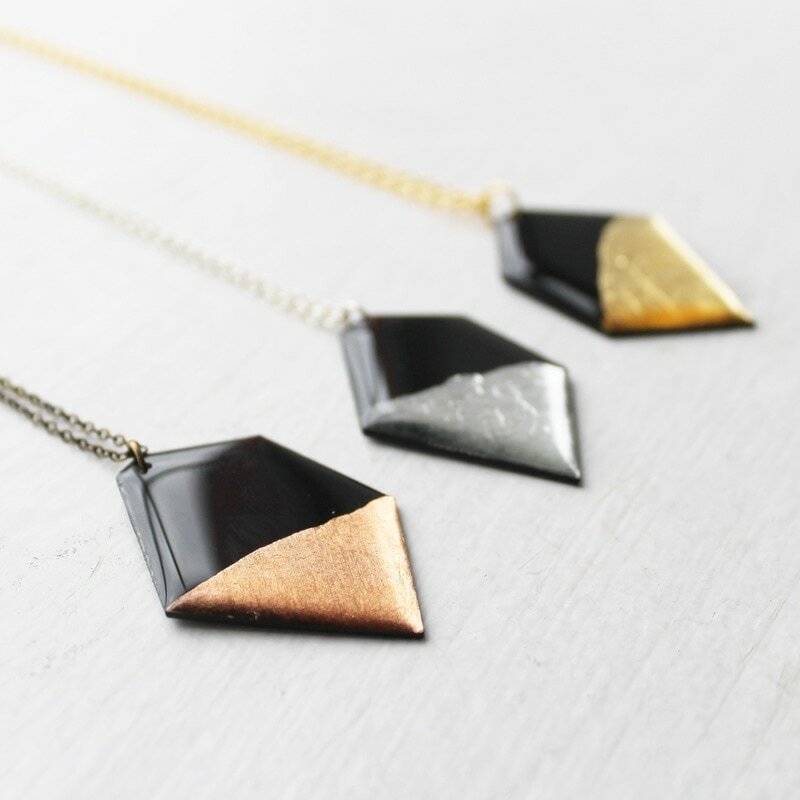 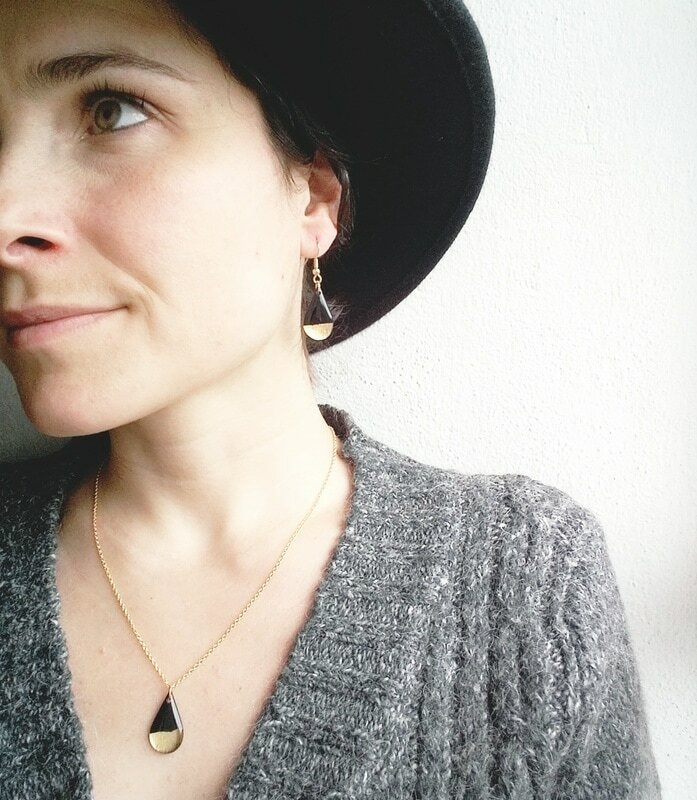 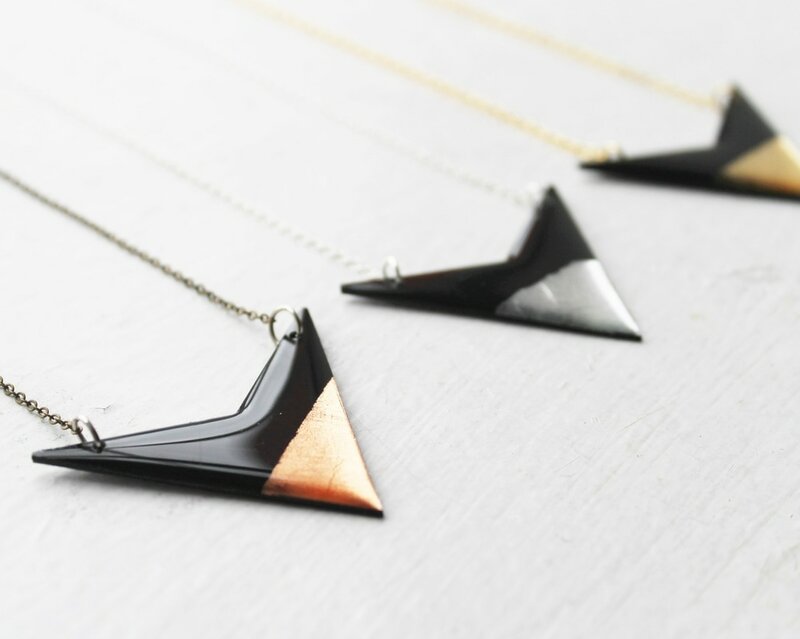 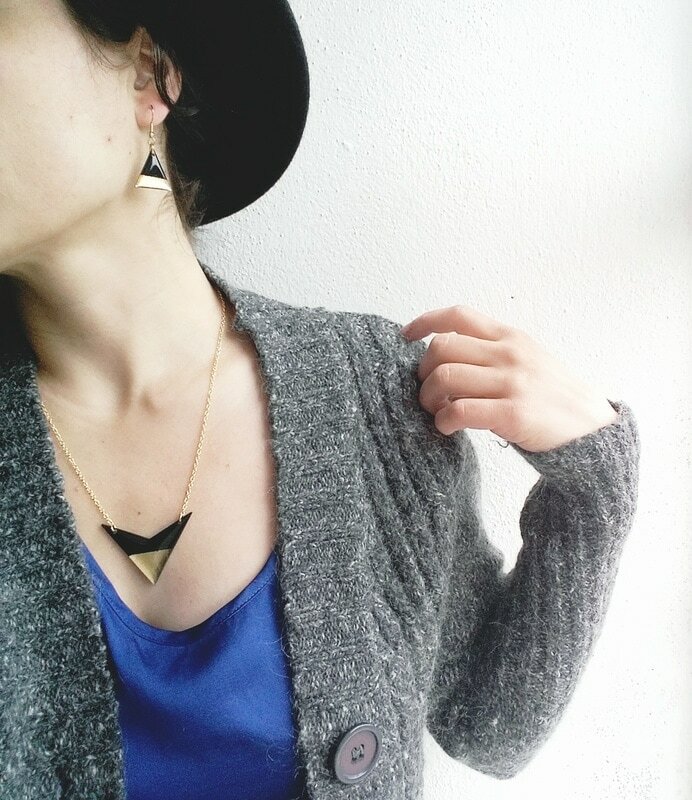 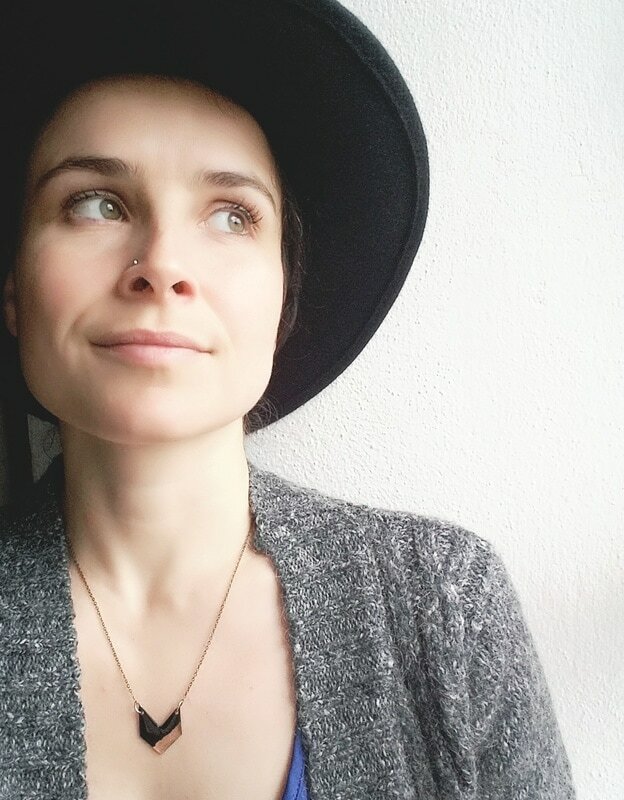 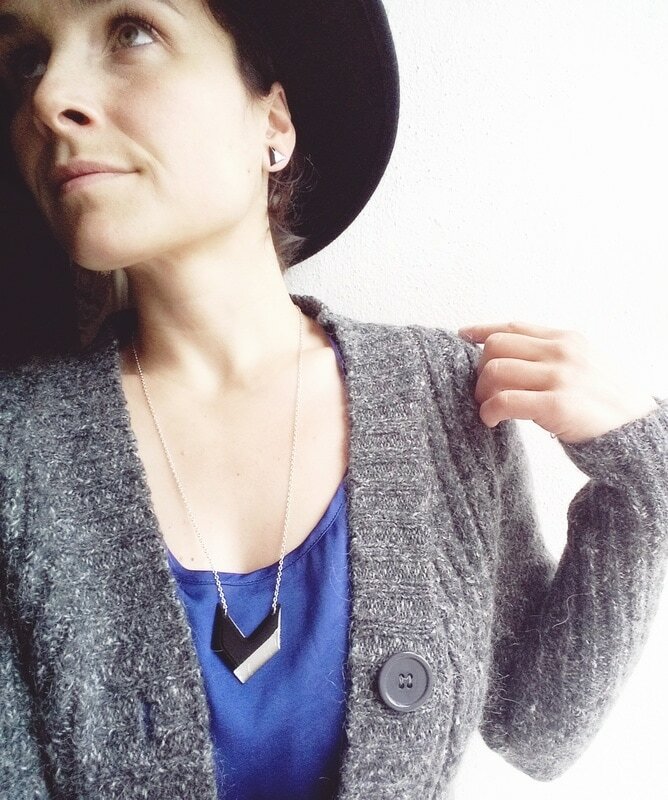 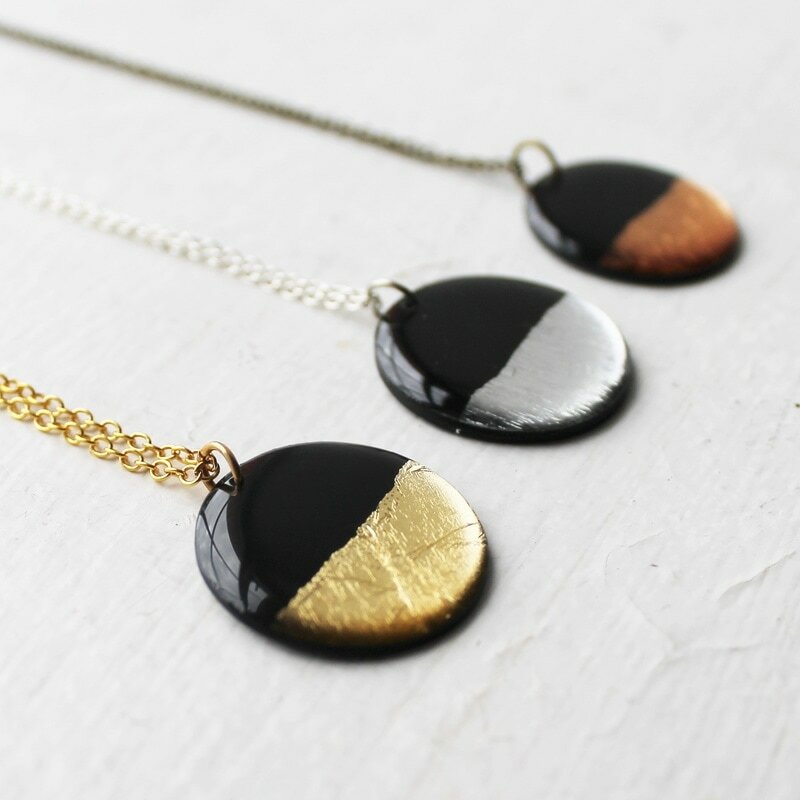 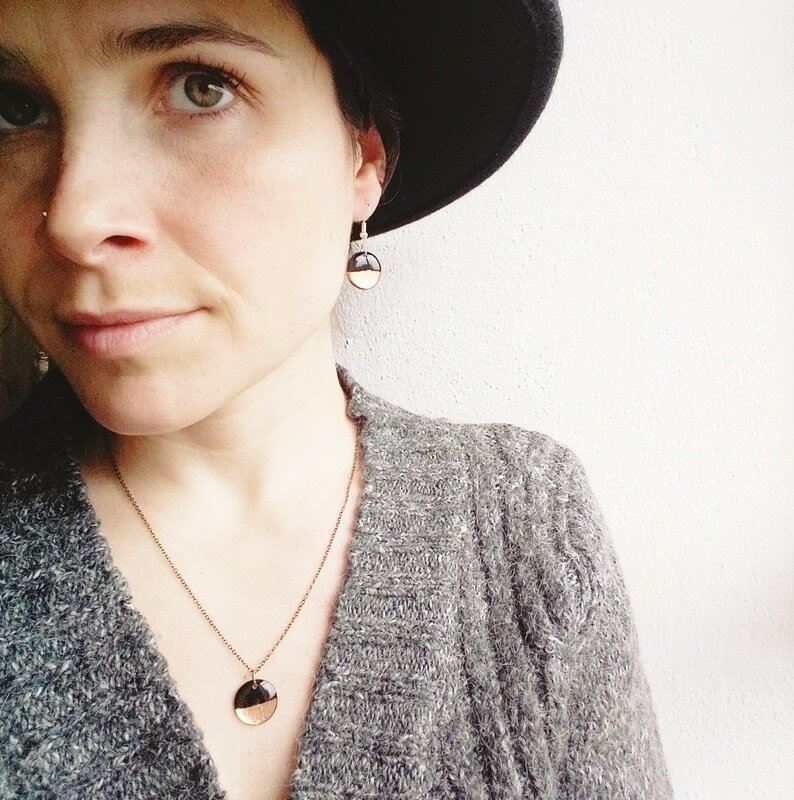 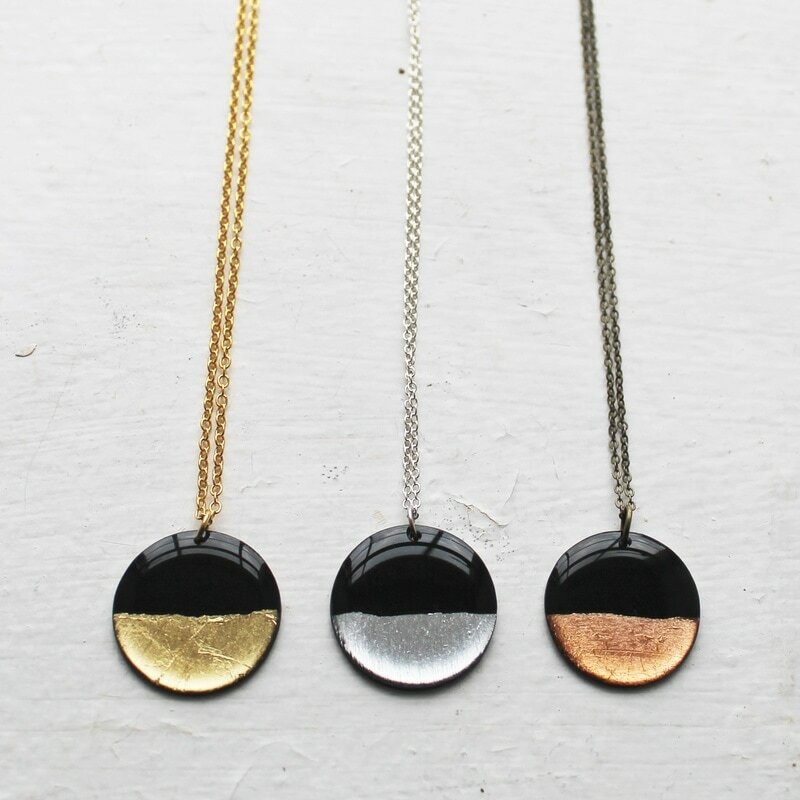 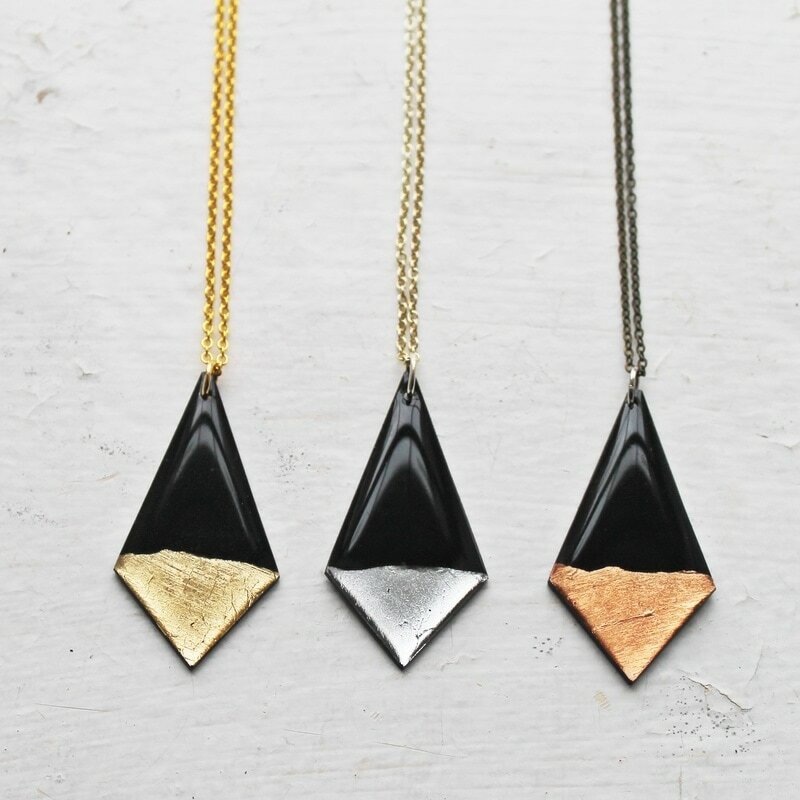 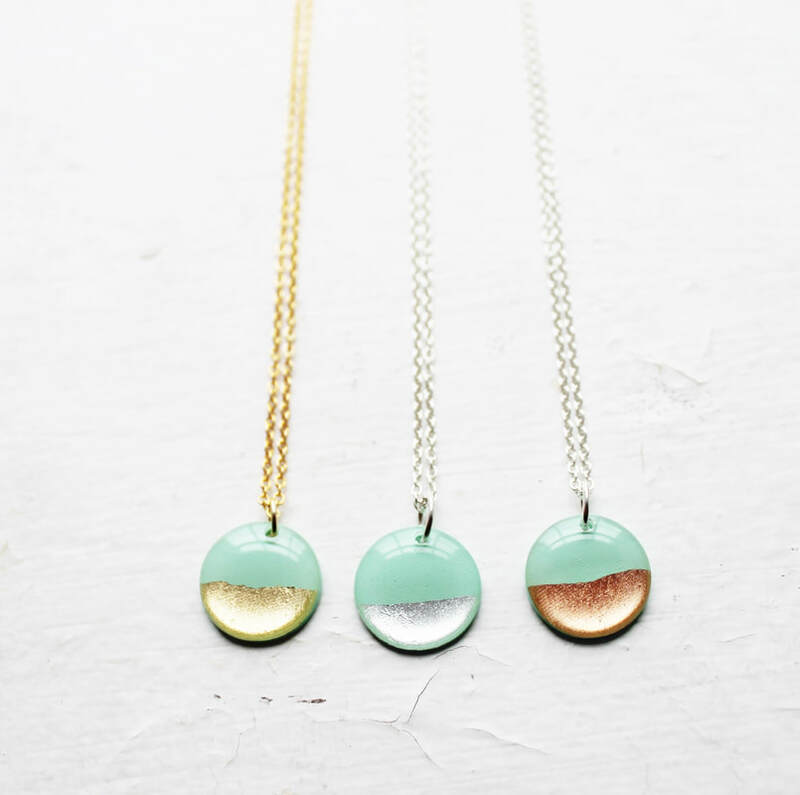 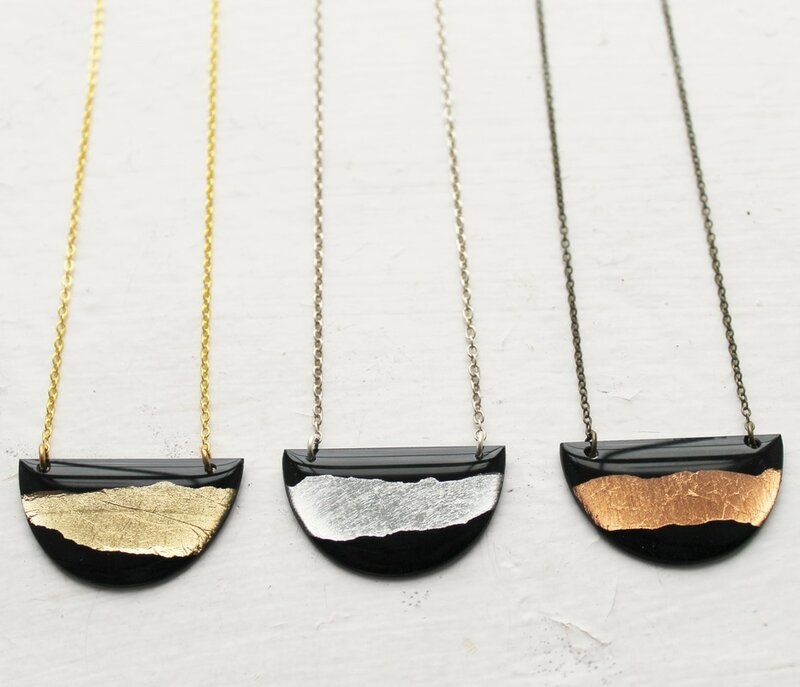 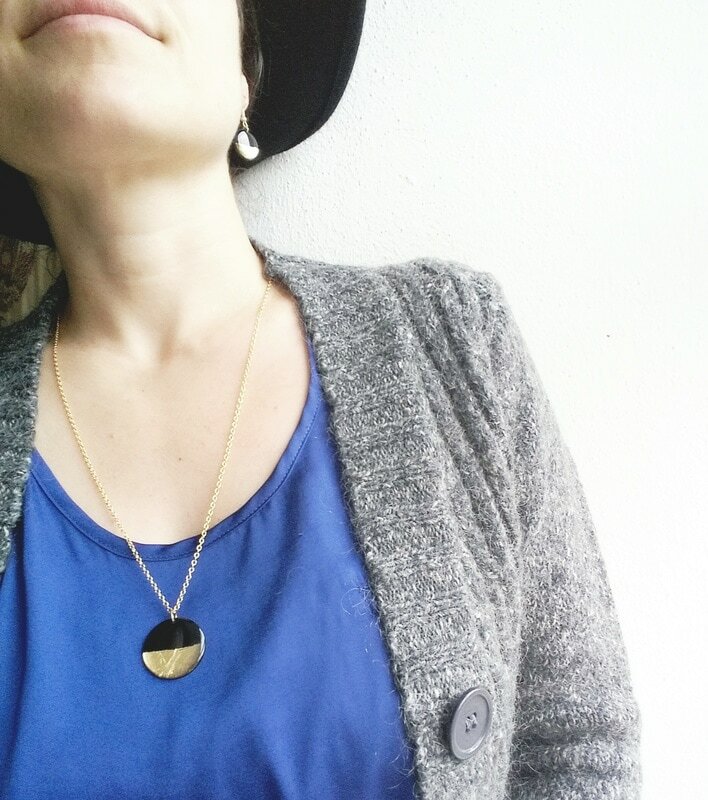 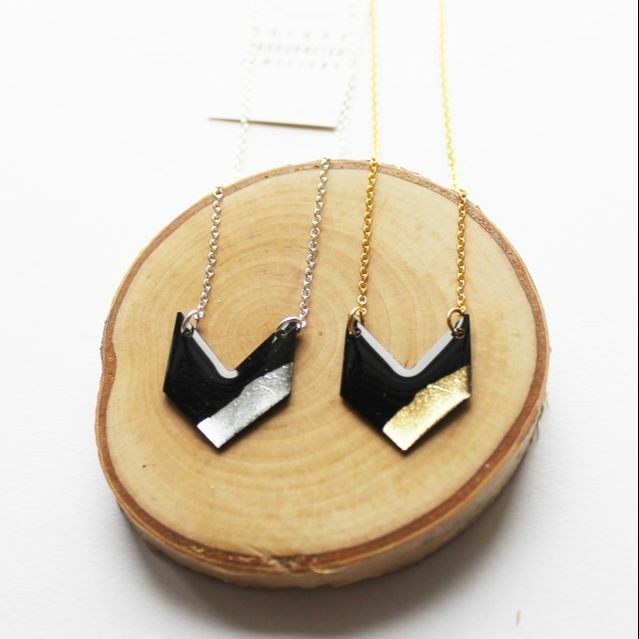 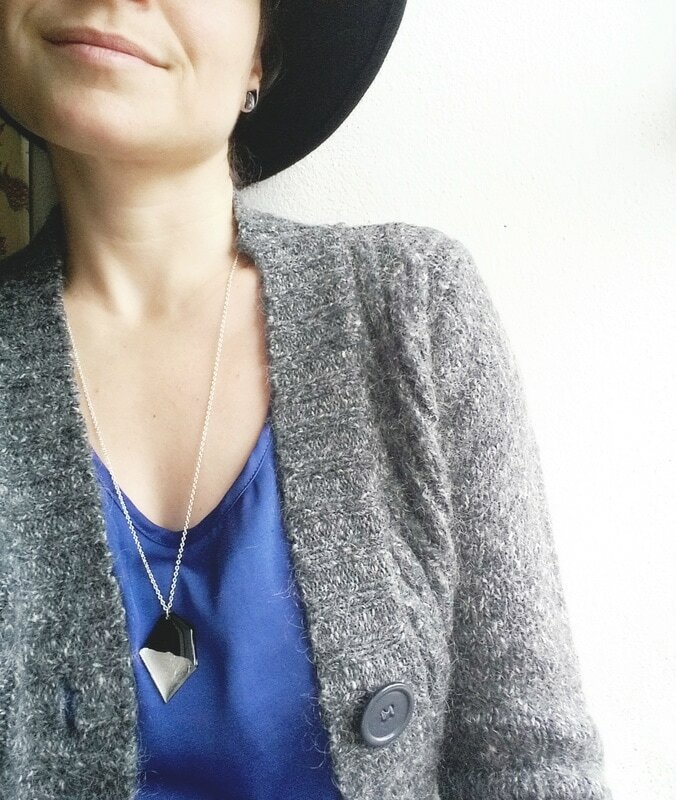 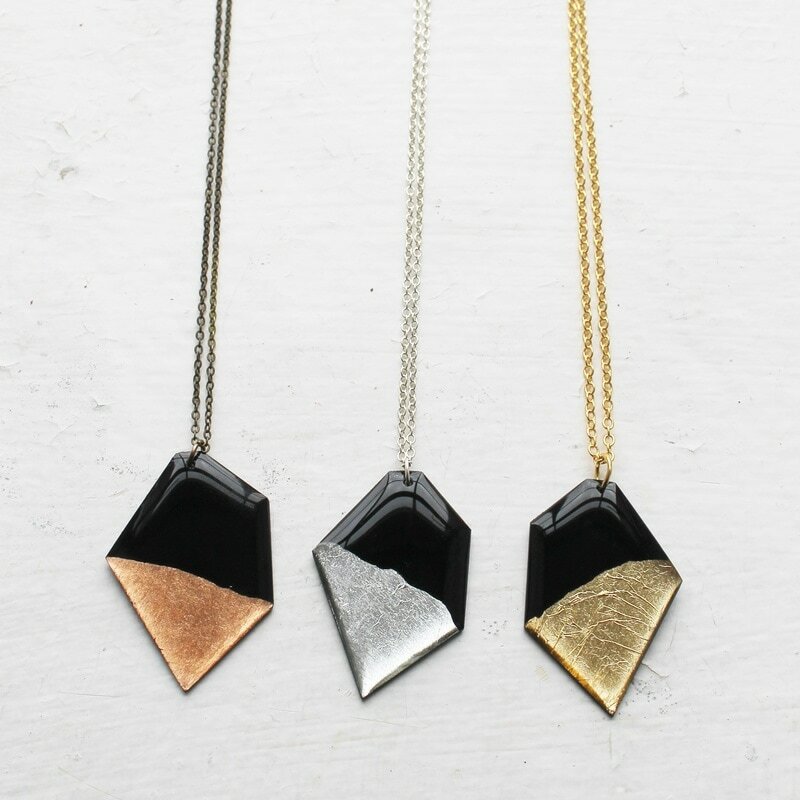 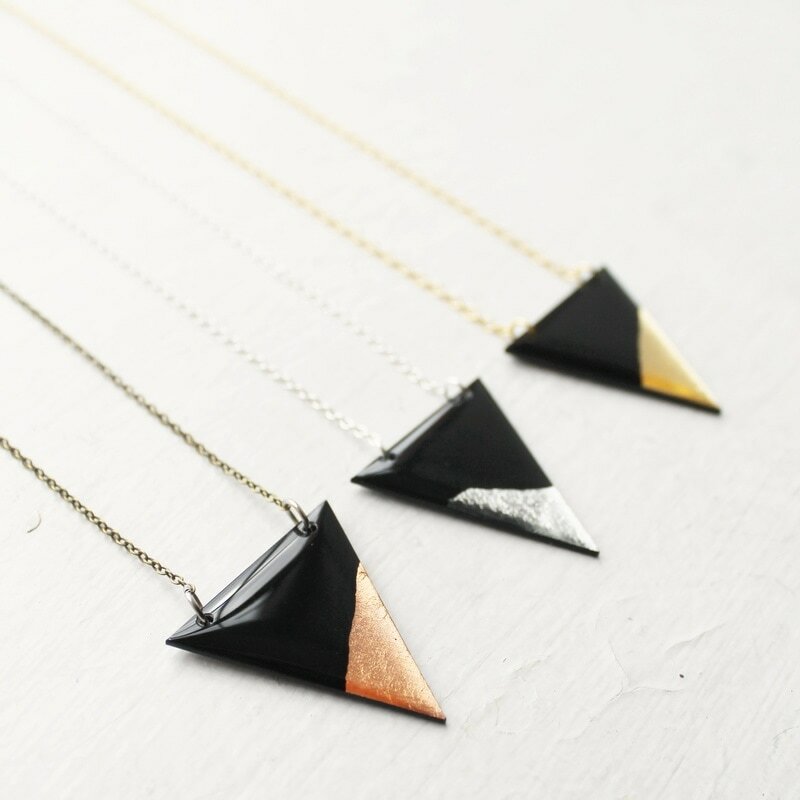 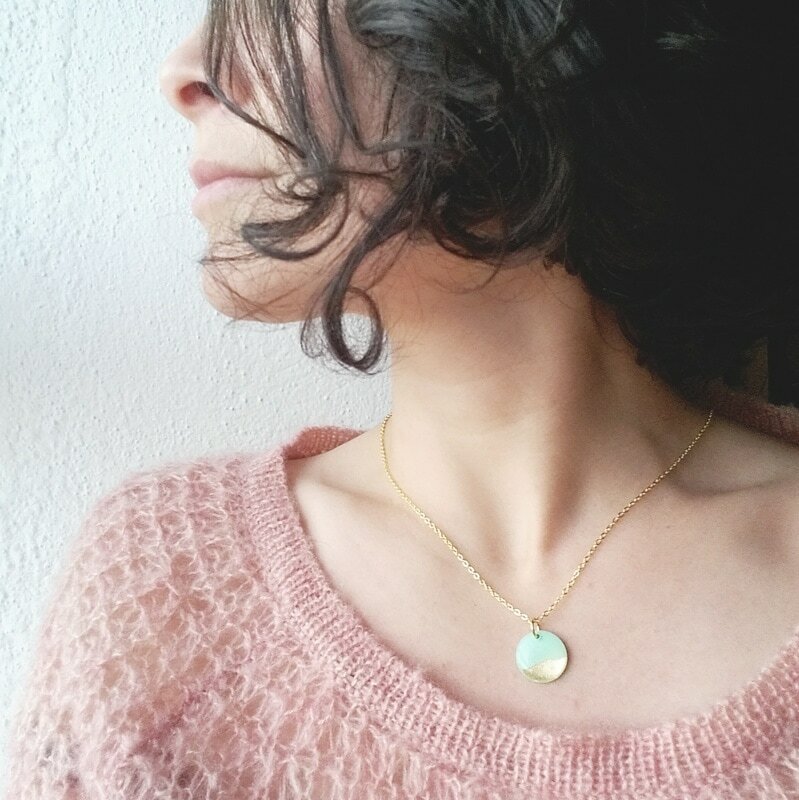 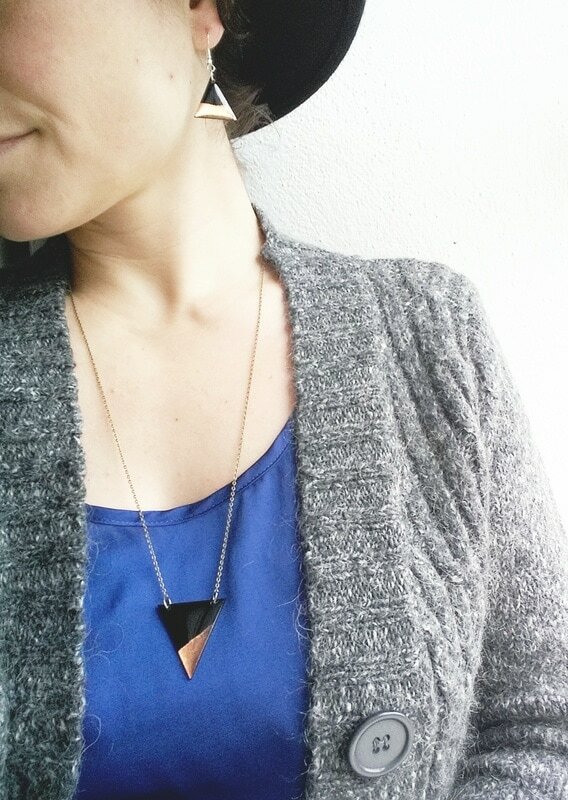 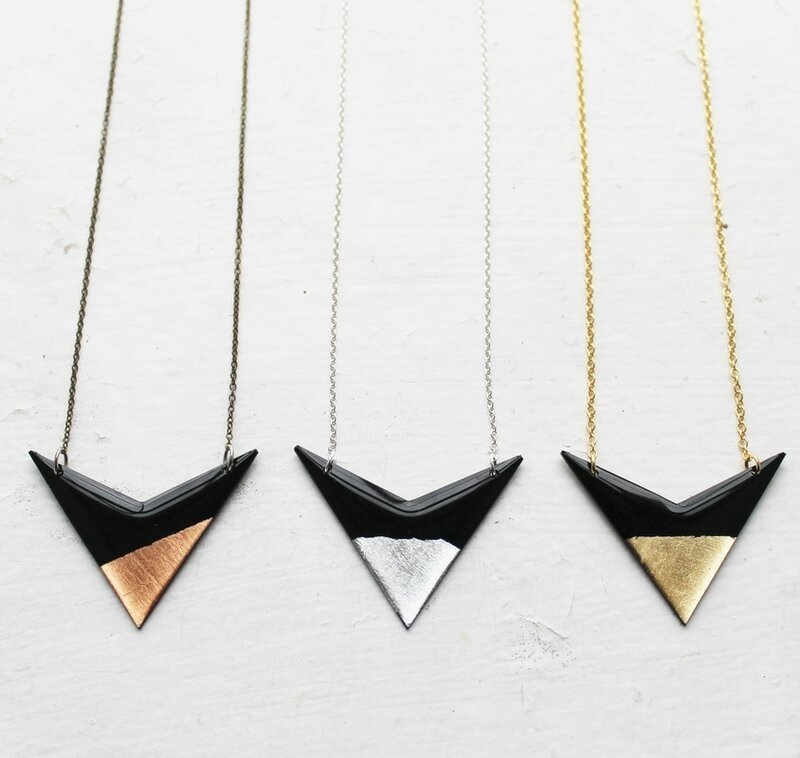 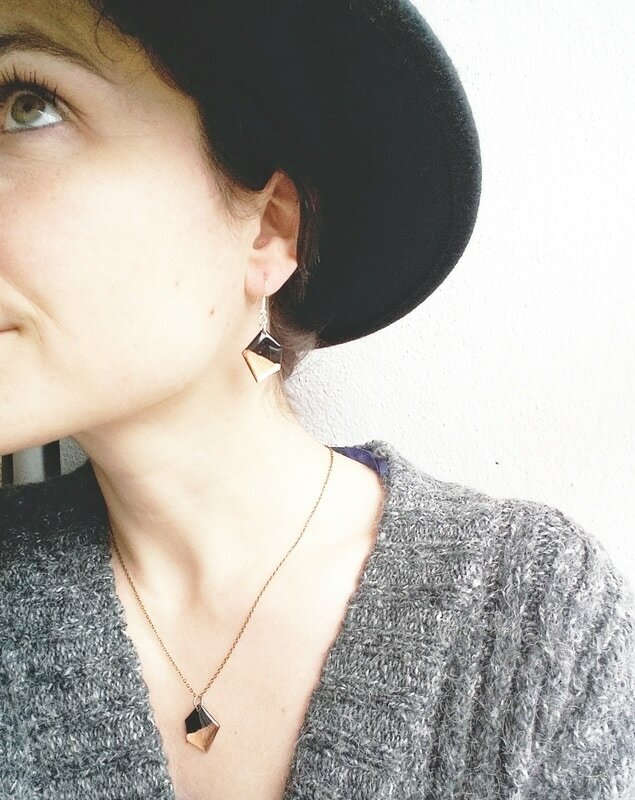 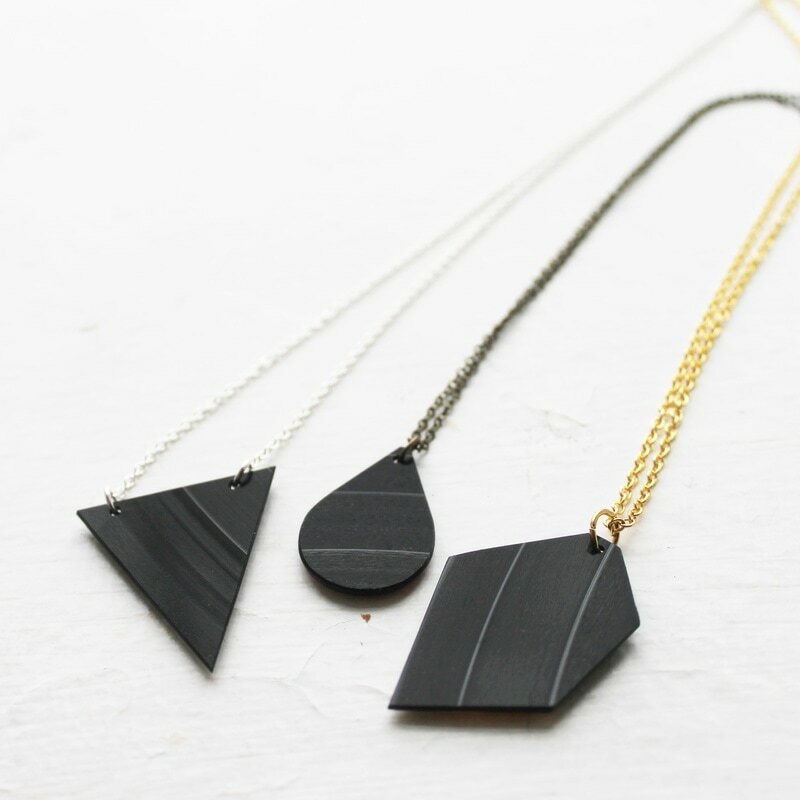 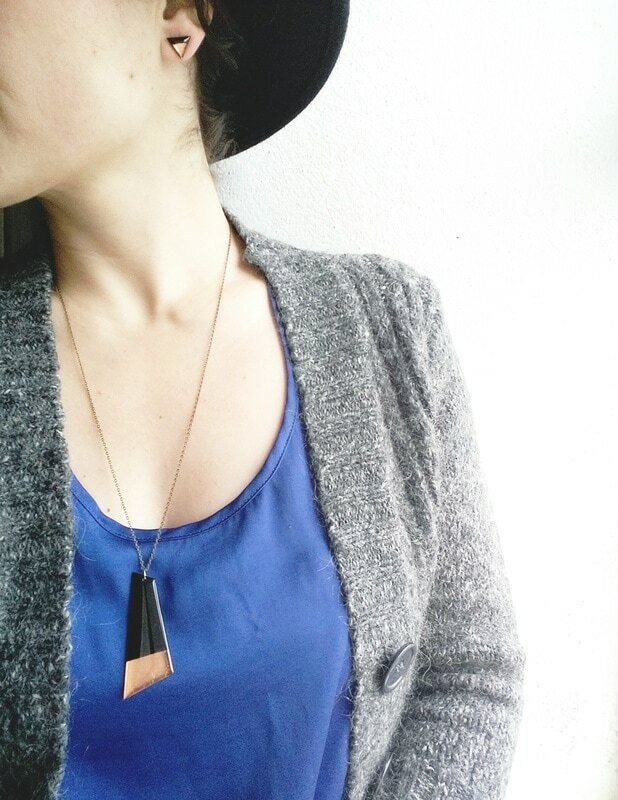 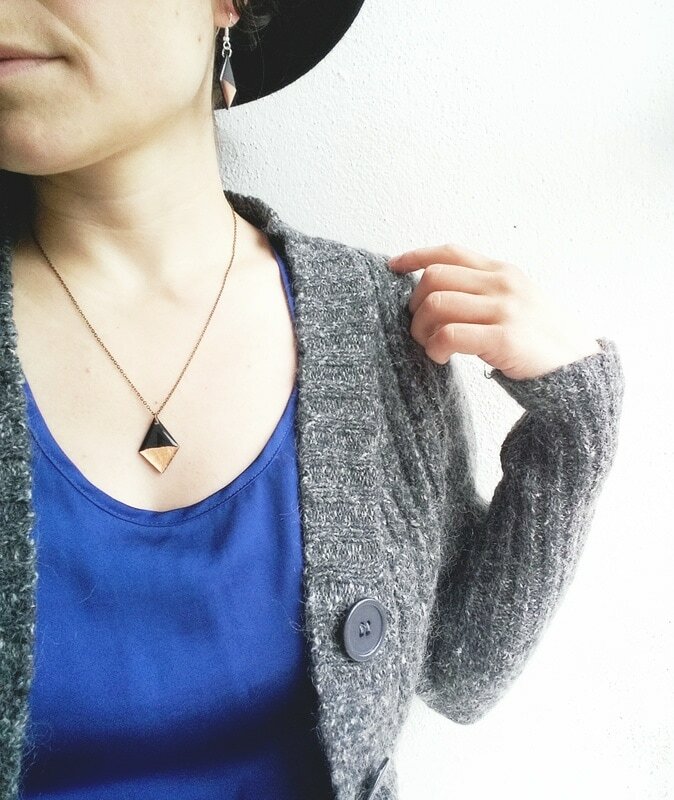 ▷ Due to the nature of the material, these necklaces are very lightweight and comfortable to wear. 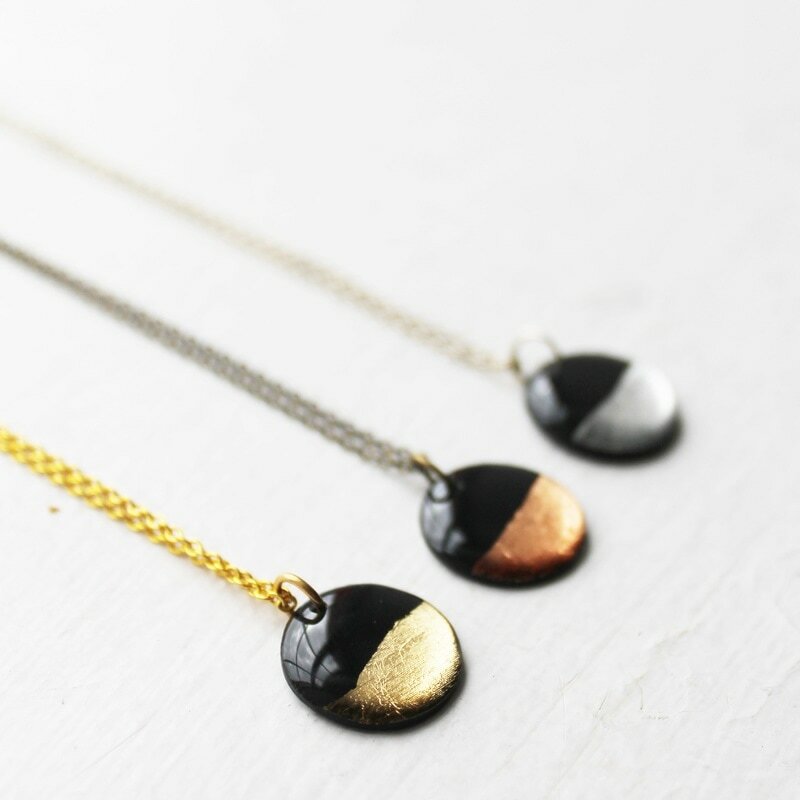 ▷ Each necklace has its card featuring my logo. 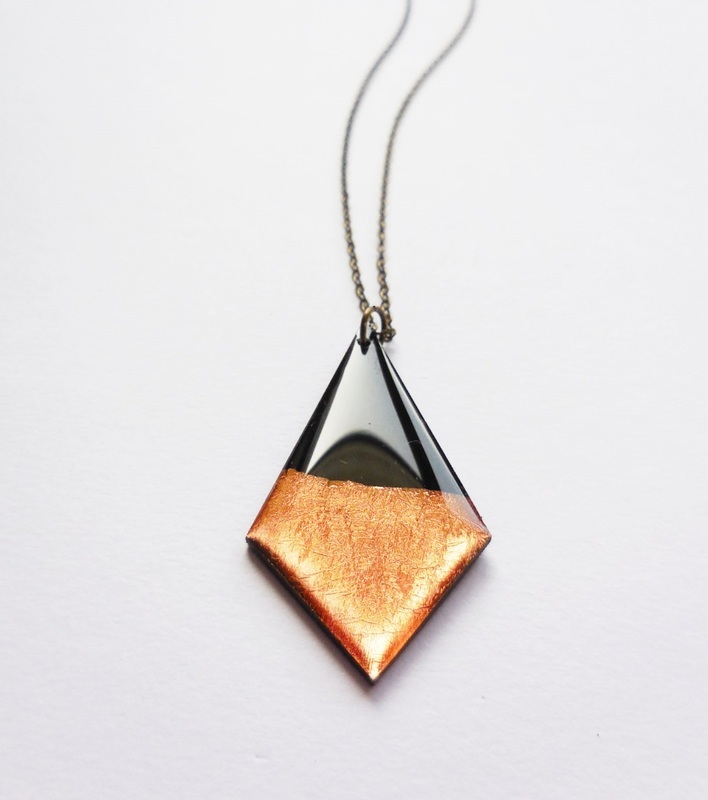 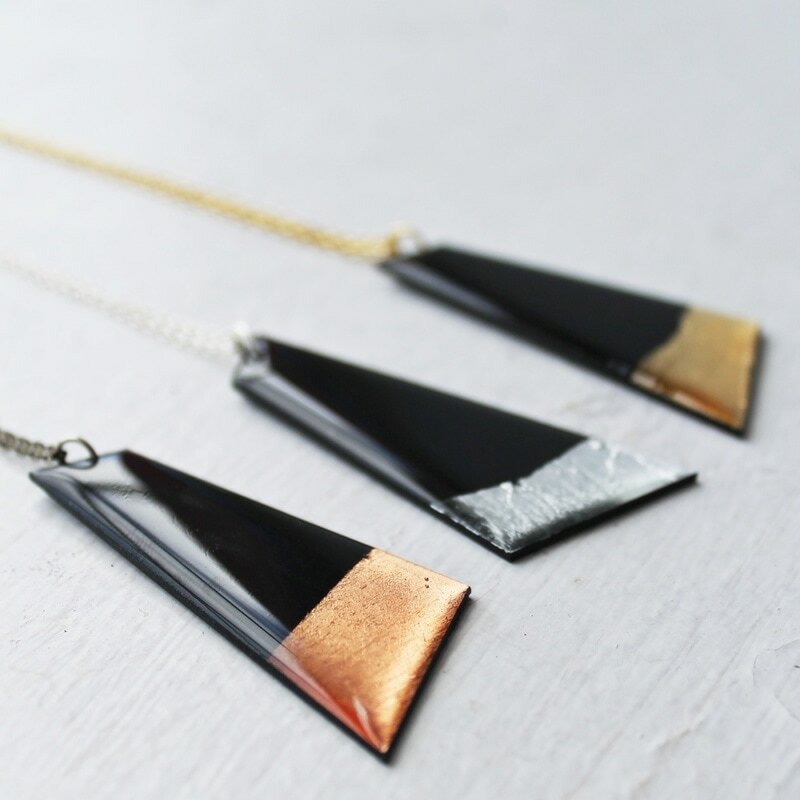 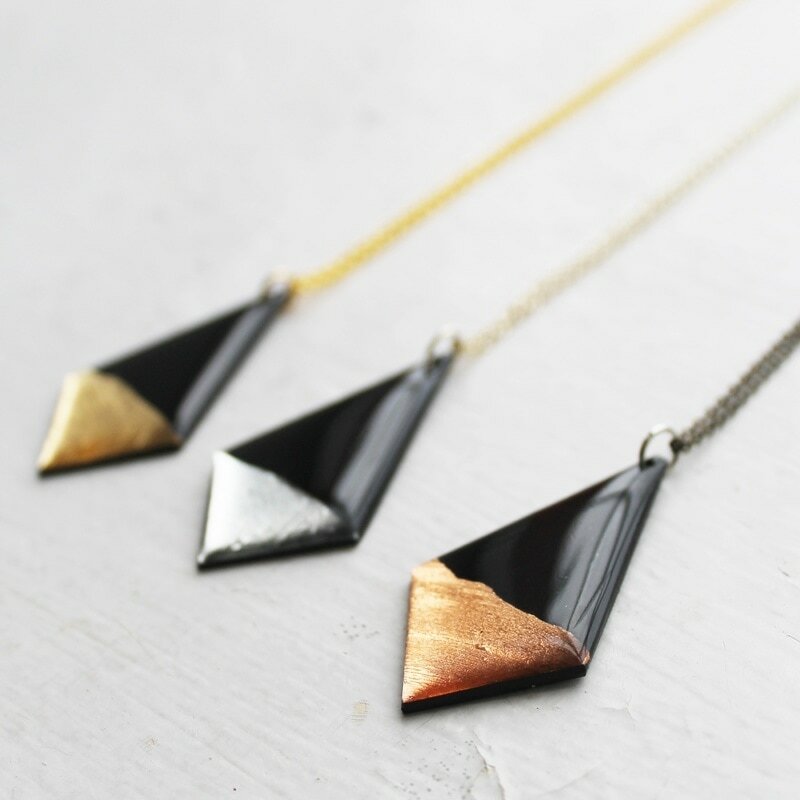 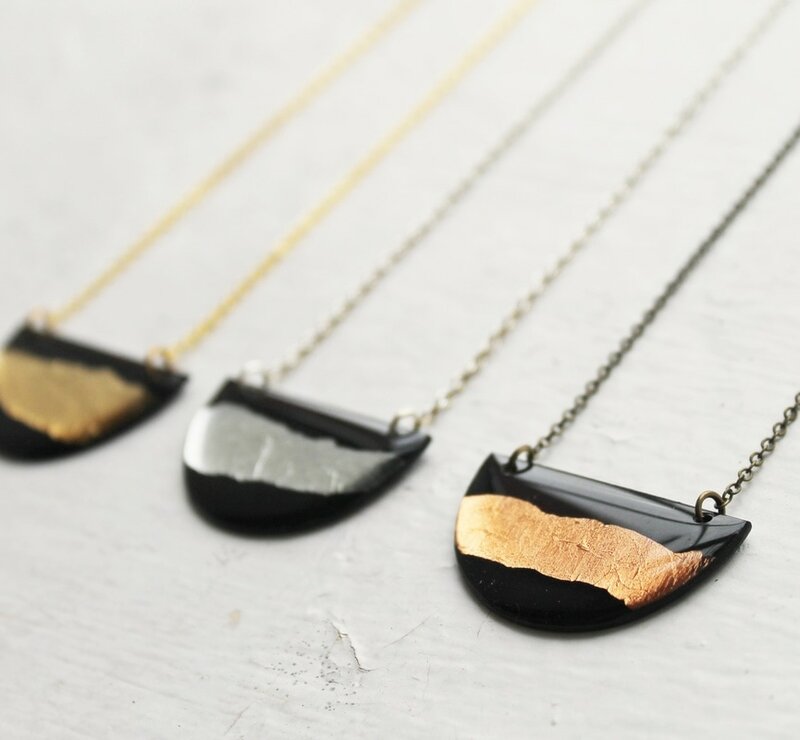 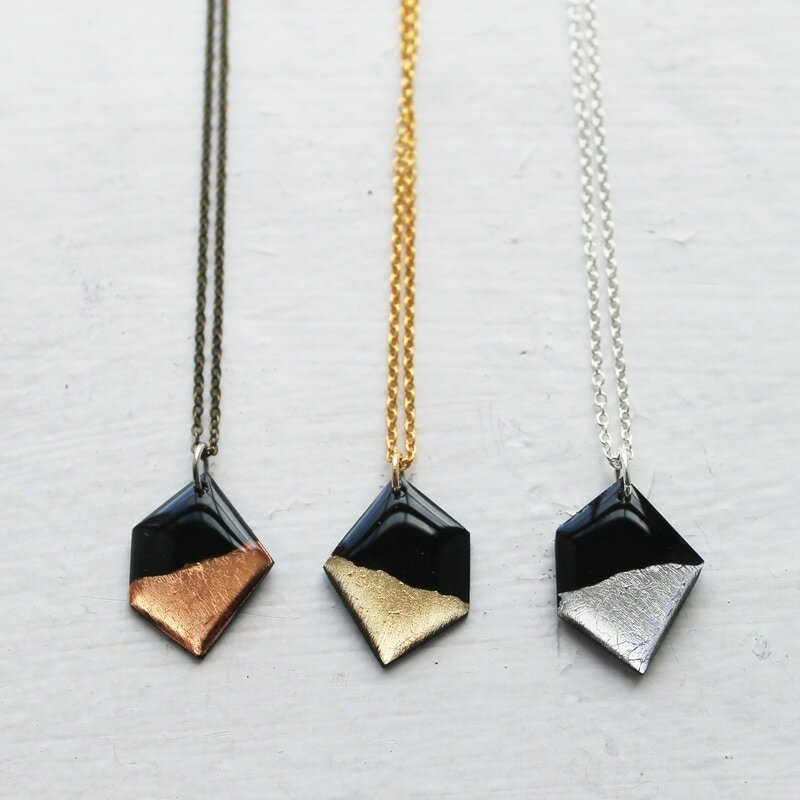 ▷ Please note that as these necklaces are individually handcrafted, placement, shape, pattern and amount of metallic leaf will vary from one piece to another. 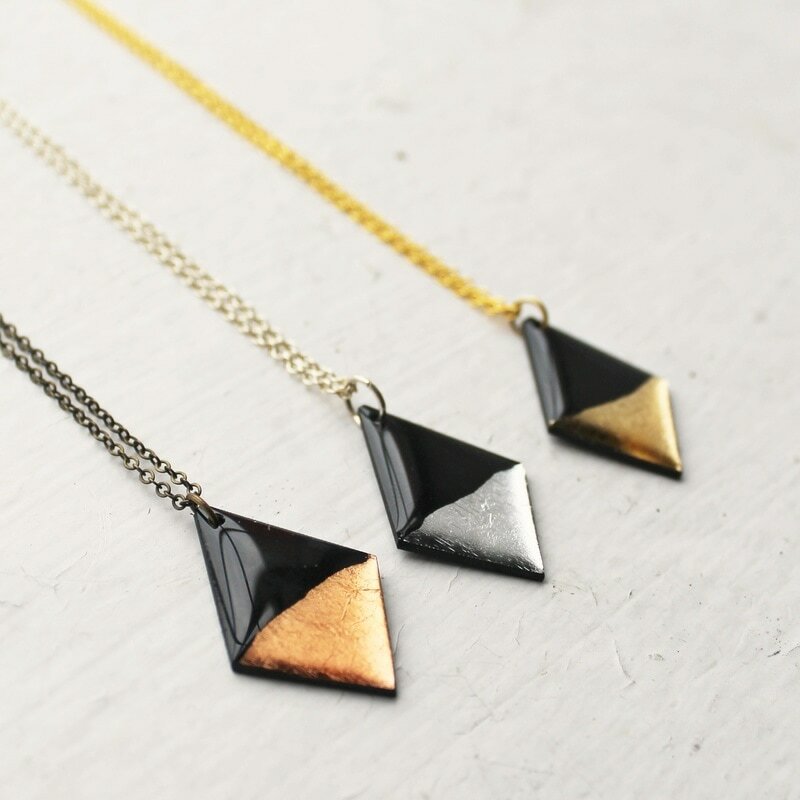 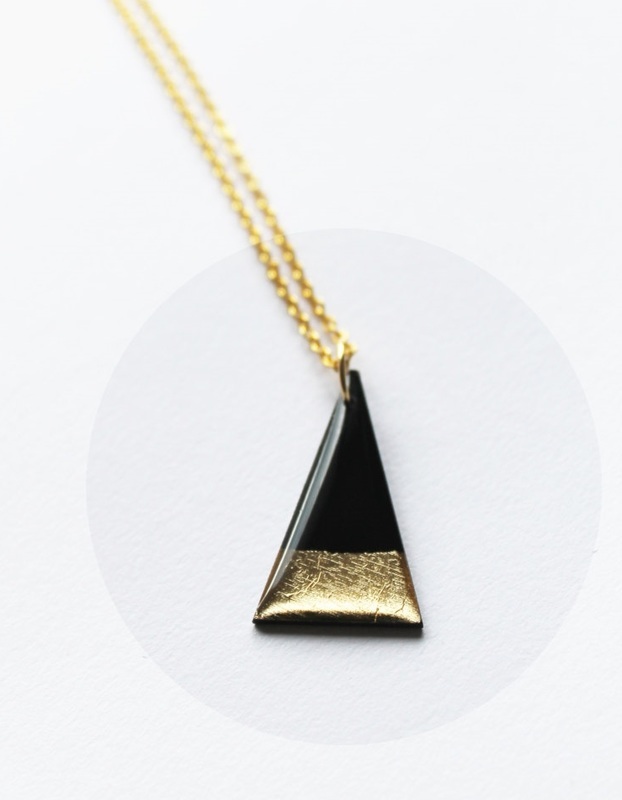 - The golden designs hang on 18K gold filled chains. 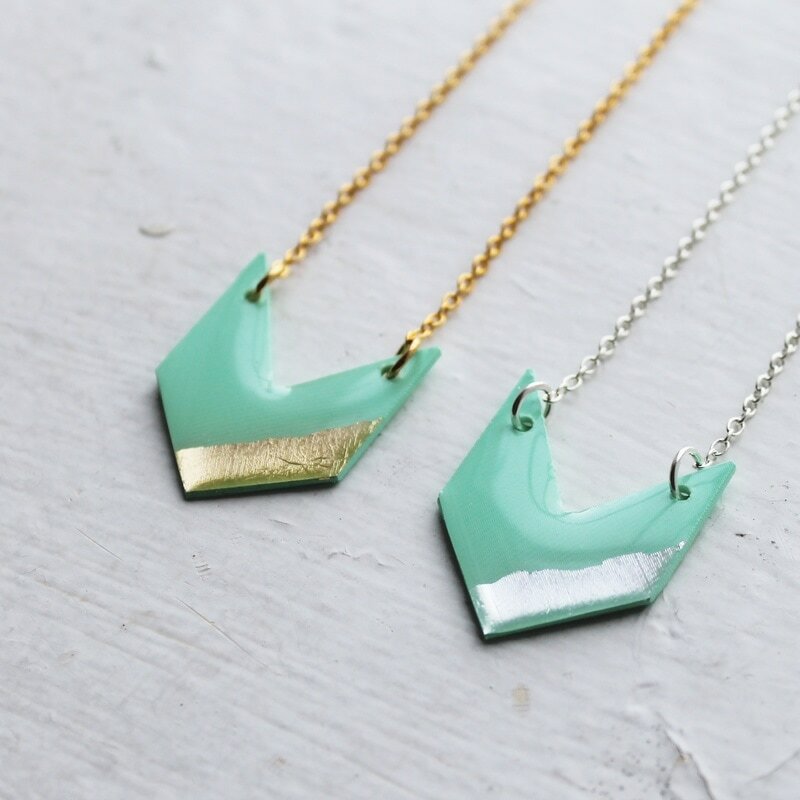 Gold filled chains are more durable and much more tarnish resistant than gold plated chain as the plating is 100 times thicker. 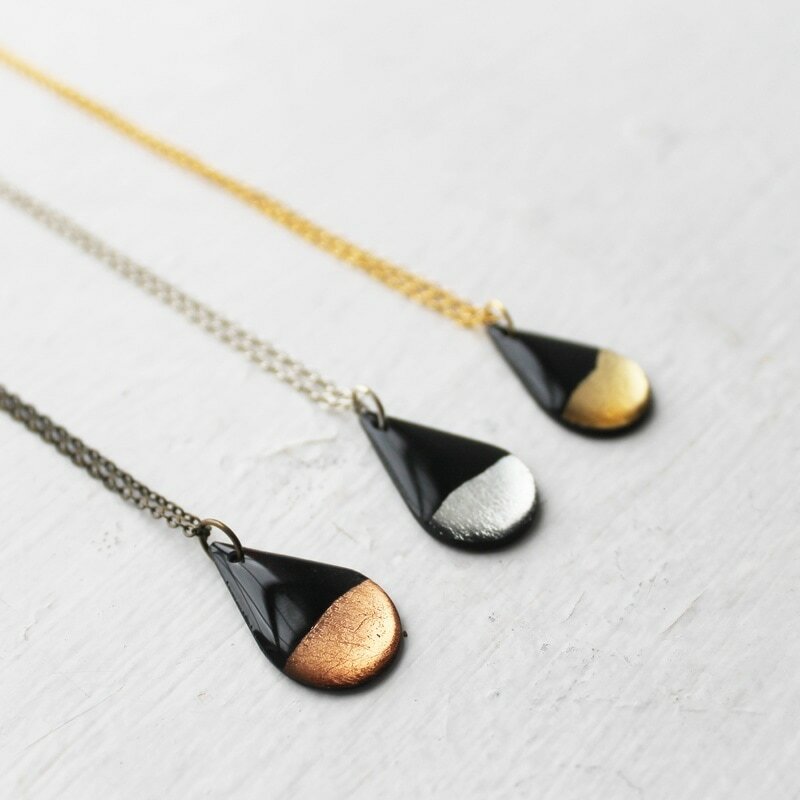 - The silver designs hang on sterling silver chains. 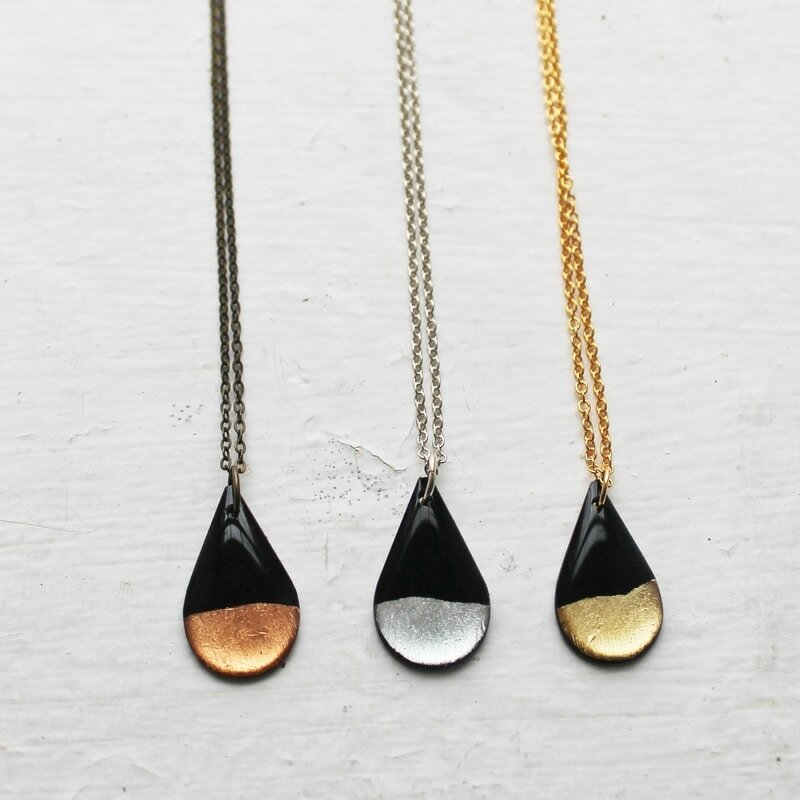 Sterling silver is 92.5% silver and 7.5% other metals and, like any other sterling silver objects, does tarnish with time. 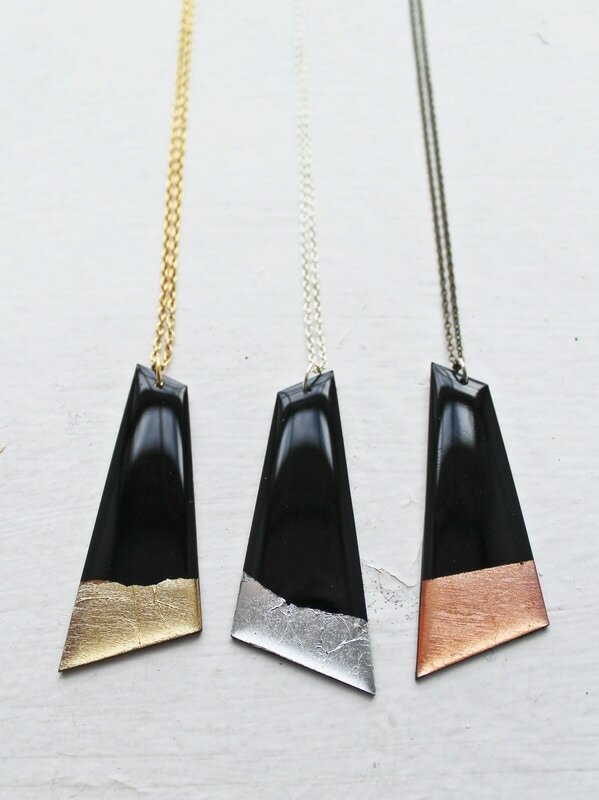 - The copper designs hang on bronze plated brass chains (antique finish). 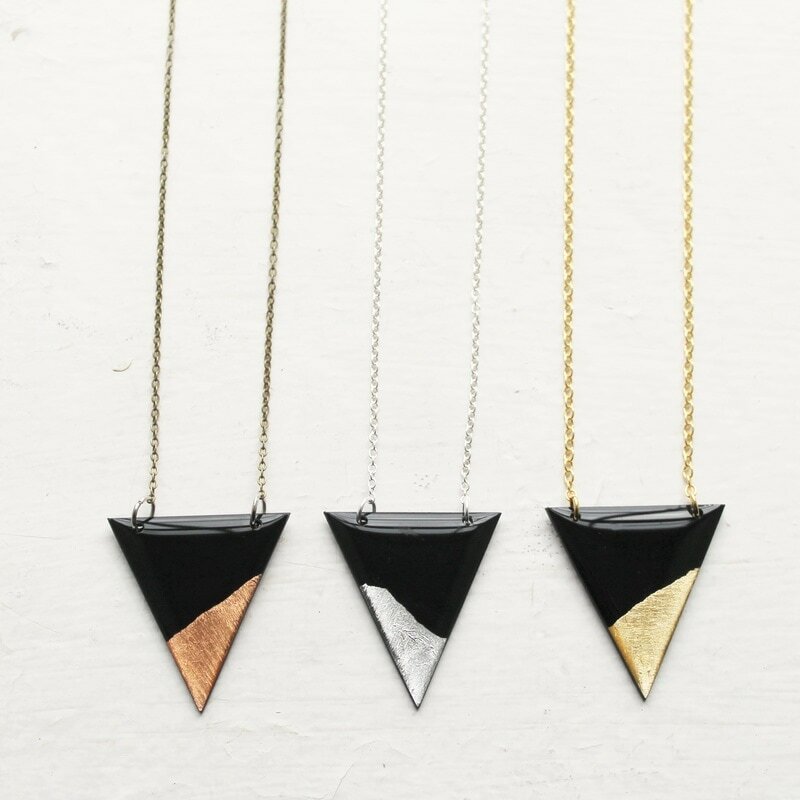 *All chains are lead and nickel free. 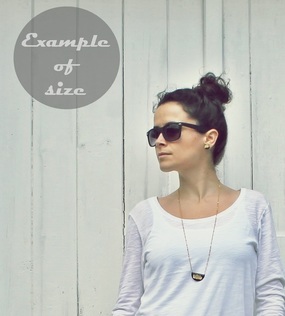 5 CHAIN LENGTHS are available (inches): 16", 18", 20", 24" and 30". 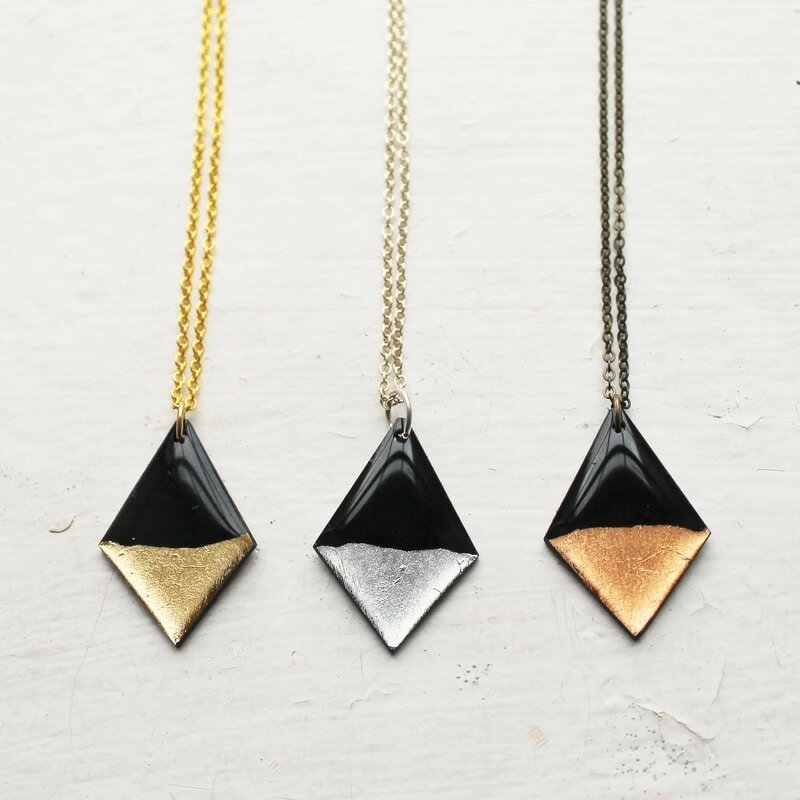 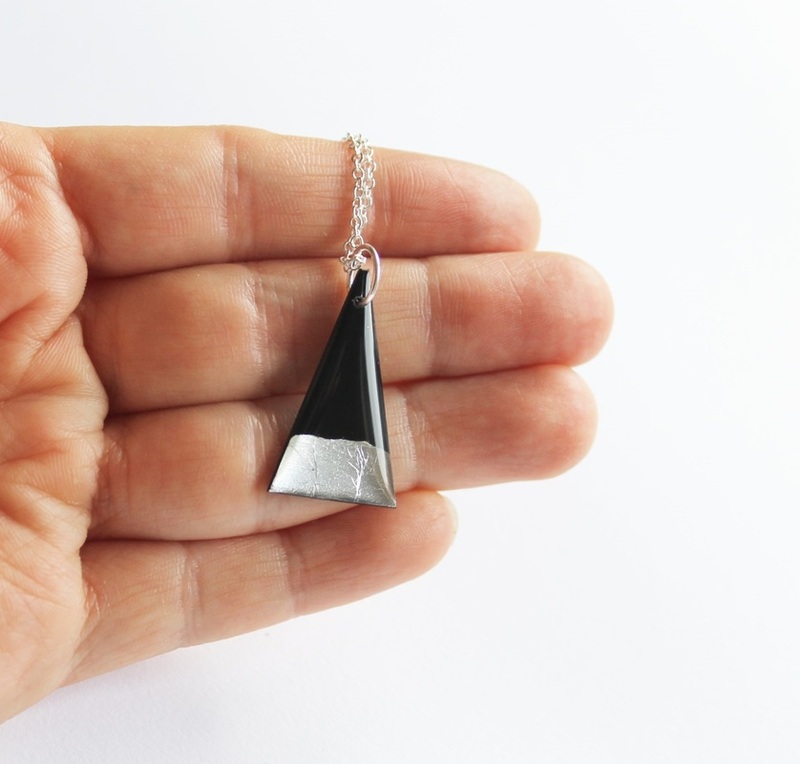 Unless specified at the time of placing your order, necklaces will come on 18 inch chains. 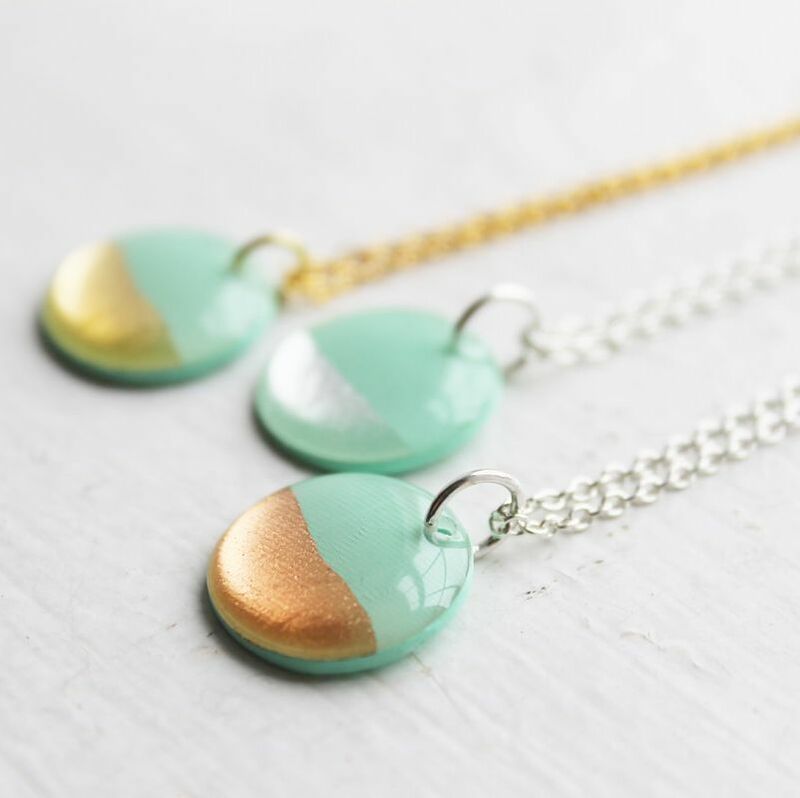 *PLEASE NOTE: All these designs are also available in the mint green vinyl with gold and silver variations although photos are not available for all designs. 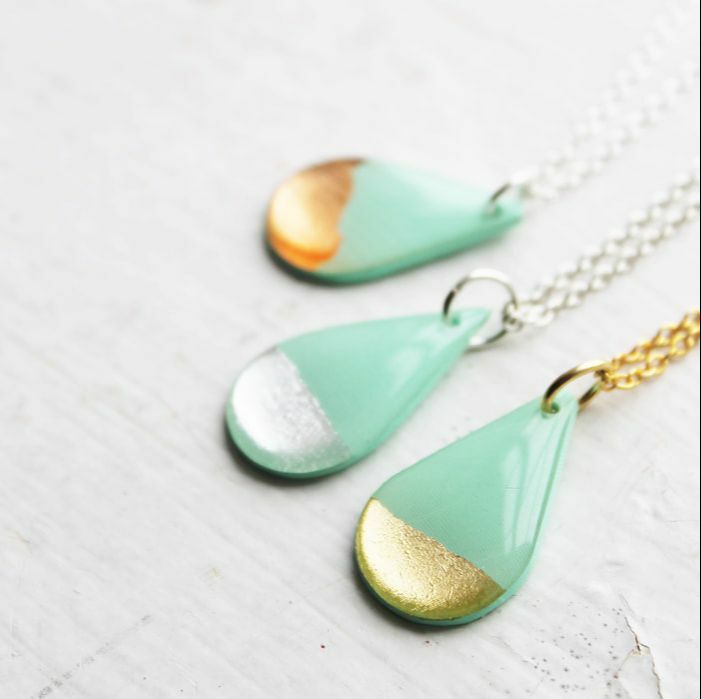 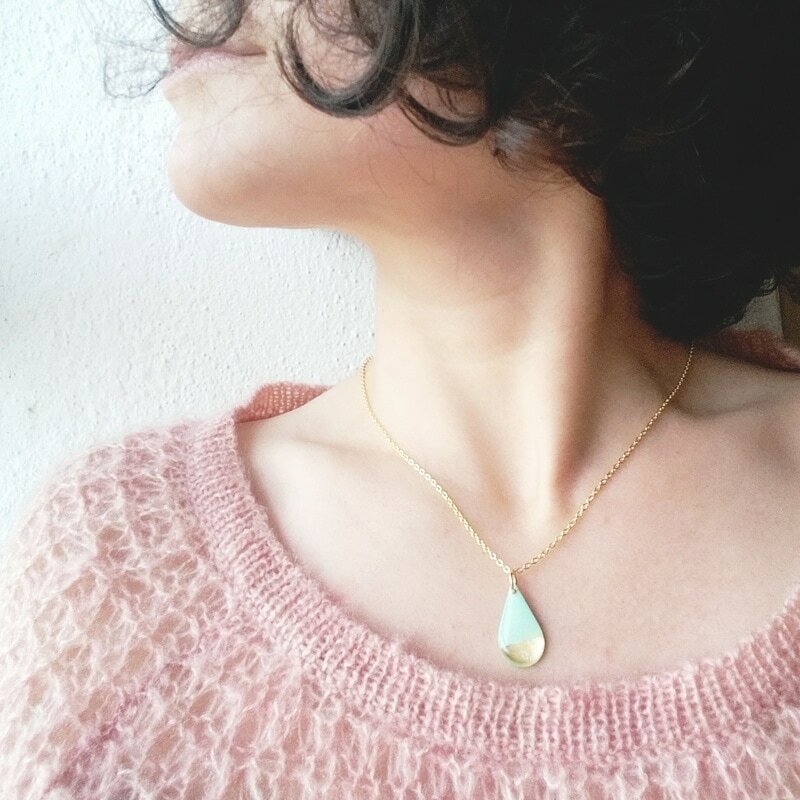 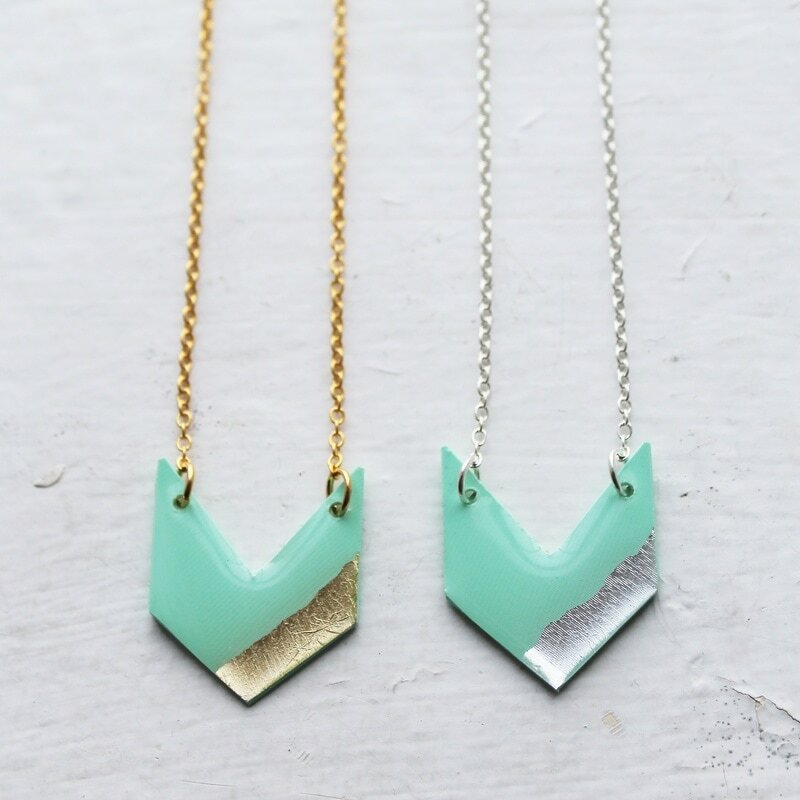 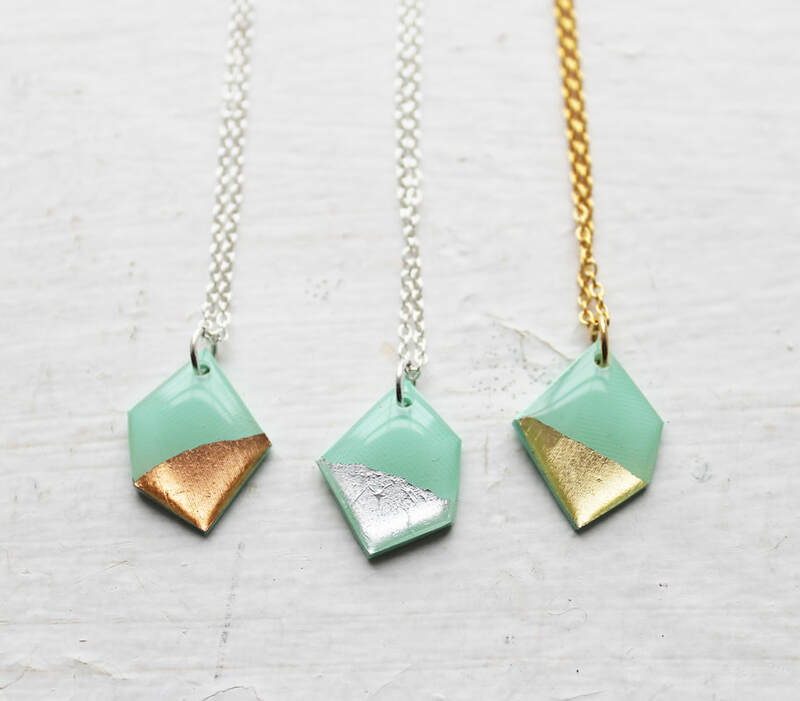 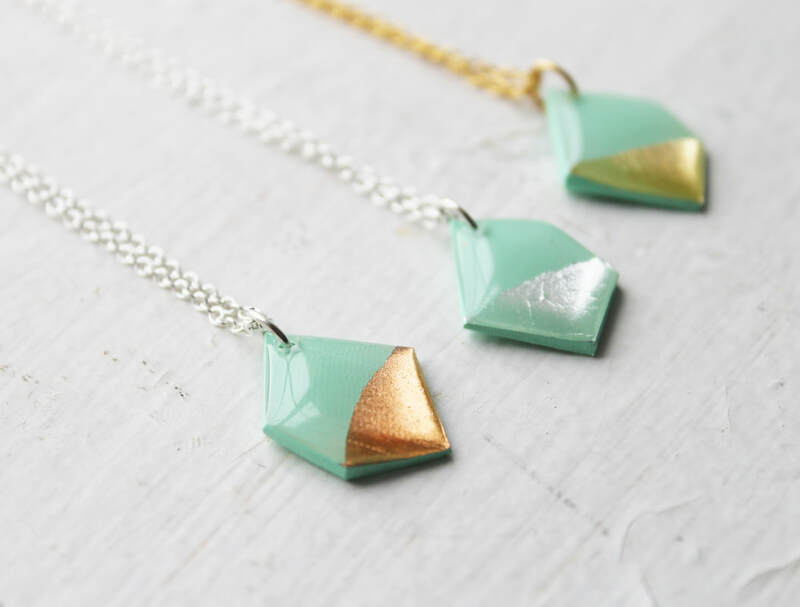 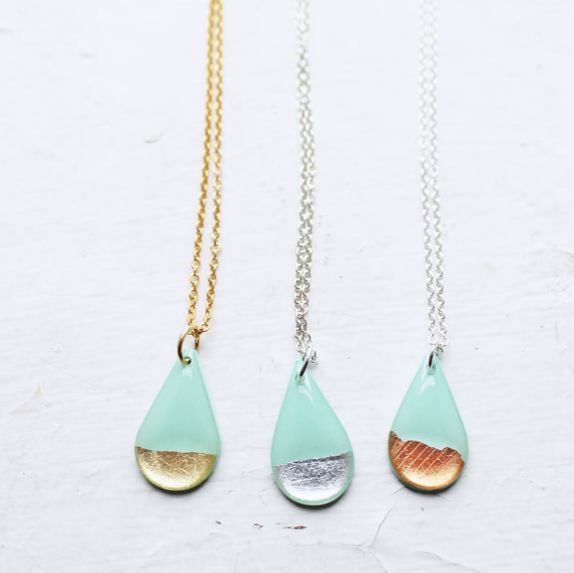 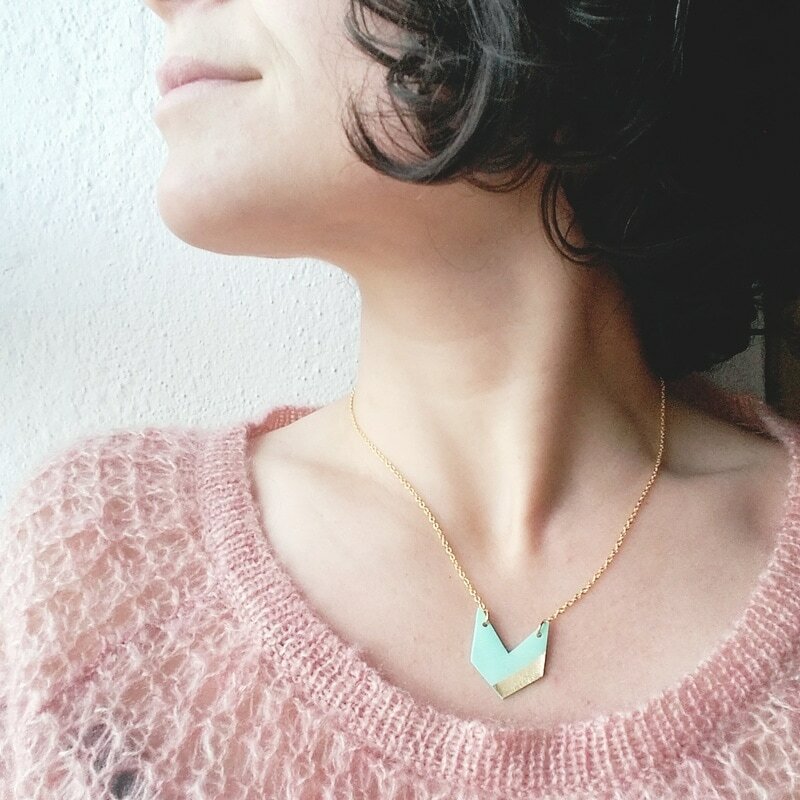 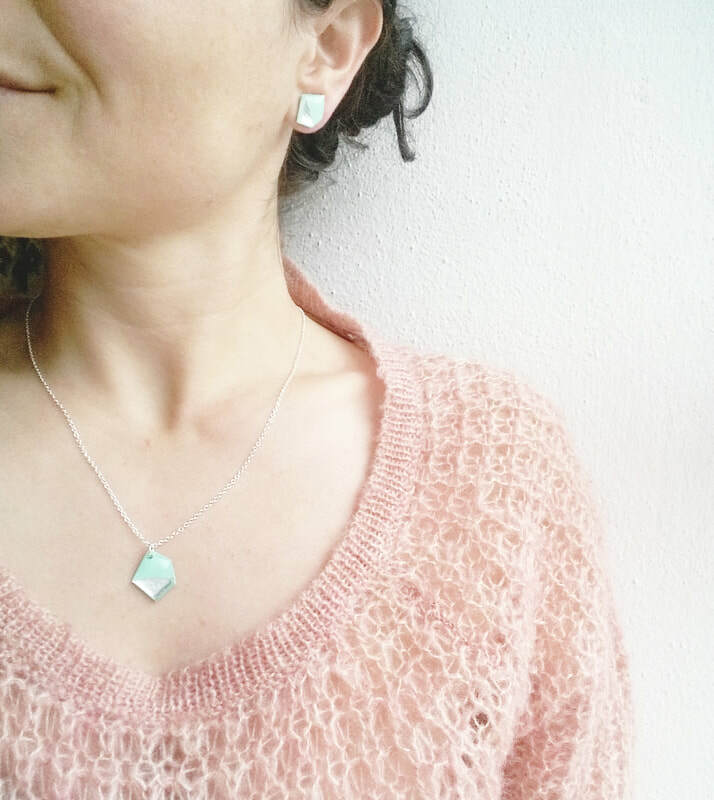 If you would like to order a design in mint green vinyl that isn't listed (for example the arrow necklace in mint green vinyl record and gold) please just mention it when placing your order. 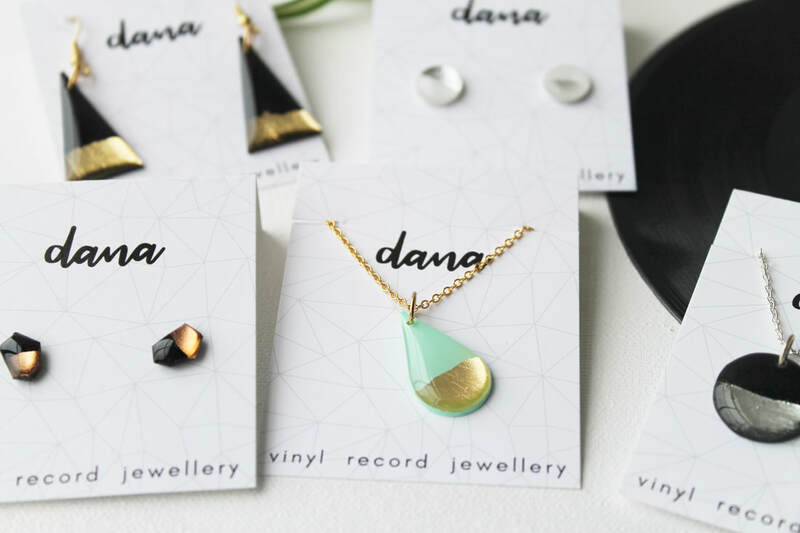 Please do not hesitate to contact me at info@danajewellery.com you have any questions or comments. 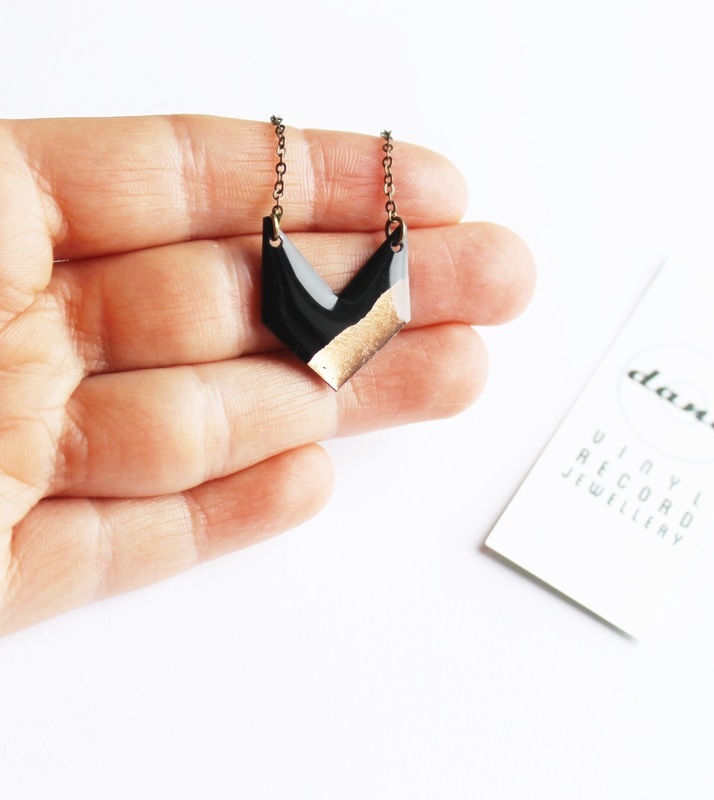 ▷ All jewellery comes on cards featuring logo and details.